A lovely flower caught during my travels this week. This is one of the great advantages to carrying a camera, even an smartphone, everywhere you go. Calla lily are always so striking with their perfect white forms, and bright yellow stamens, over their dark green foliage. 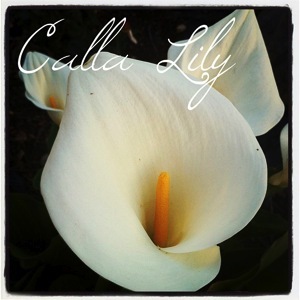 Zantedeschia aethiopica (common names calla lily, arum lily; a.k.a. varkoor, an Afrikaans name meaning ‘pig’s ear’) is a species in the family Araceae, native to southern Africa in Lesotho, South Africa, and Swaziland. Categorized under: Bulbs, Education, Flowers, Garden Alphabet, Horticulture, Photos, Plants.